The new year is here and it has been a great start. 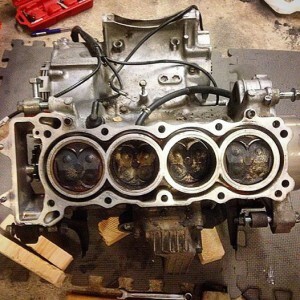 Together with a friend, an impact driver and some force we managed to crack open the cylinder head bolts. It wasn’t easy but we did it so we could finally remove that part of the engine to have a look underneath. It was dirty. Like really dirty. I don’t know if the piston heads are supposed to look like that but they looked dirty. We also removed the starter motor, the alternator cover, the clutch cover and some minor parts. Things are getting more complicated now and I am beginning to doubt if my skills are adequate to put it back together. There are just too many variables, too many things supposed to measured, too many things to keep track of. But we’ll continue. One thing I’ve learned is to carefully read the manual in order to figure out what to do with everything in the frame and out of it. As it is, we are having a hard time loosening the centre clutch nut because we are lacking the option of putting it in top gear and pressing the rear brake. Not easy to do on a standalone engine. If my luck runs out, I might just have to buy one of those universal clutch basket tools to stop everything from spinning. Still, it’s not only fascinating but educating as well. When all this is done, I doubt anything motorcycle technology related will scare me. I won’t be able to do anything electronically but hardware wise, nothing can be more complicated than it already is. Taking the dirt bike apart will be a piece of cake, I reckon.